The U.S. Postal Service will no longer deliver mail to the door for new addresses, pushing mail recipients to instead cluster their mailboxes in a centralized area. The new policy marks a sharp shift as the agency continues to find ways to cut costs and follows through on a proposal for which it has long advocated. USPS announced the change in a recent update to its Postal Operations Manual, in which it also made “centralized delivery” its preferred method of dropping off mail. Having letter carriers deliver mail to a cluster of mailboxes rather than to each individual door allows for more efficient routes that can be completed more quickly. Advocates for the change have said the new policy could save the Postal Service billions of dollars annually as it continues to look for ways to reduce its labor costs. Detractors have argued the shift would unfairly target urban dwellers and reduce the value of mail-based advertising. As of 2013, about one-third of U.S. addresses received to-the-door delivery, most of which were located in large cities. Clustered boxes in neighborhoods force individuals to deal with safety and weather issues, opponents of the change have said. USPS also updated its manual to require addresses that receive curbside delivery to have their mail receptacles “be grouped two to a property line, where possible.” By making centralized delivery its “preferred mode,” USPS is virtually eliminating any other delivery method for new addresses. “Curbside, sidewalk delivery, and door modes are generally not available for new delivery points, with very rare exceptions, as determined by the Postal Service in its sole discretion, on a case-by-case basis,” the agency wrote in its update. Dave Partenheimer, a USPS spokesman, said the centralized delivery part of the update was not new policy per se, but a "clarification of that fact." Lawmakers have for years debated the merits of eliminating or reducing door delivery, with the issue proving a key sticking in failed iterations of postal reform efforts. A bill unanimously approved by the House Oversight and Government Reform Committee would take the change a step further. The legislation would convert to-the-door delivery to curbside or clustered drop offs, requiring incremental conversions for businesses. For residential addresses, door-to-door delivery would cease only if 40 percent of the impacted residents sign off. New home addresses would still be able to receive door delivery if their neighbors already do. The measure has yet to receive a vote on the House floor. 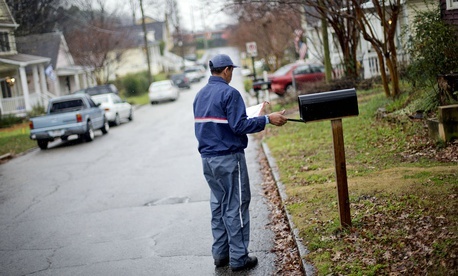 A Senate postal reform bill does not address the delivery method issue. Rep. Darrell Issa, R-Calif., who as a former chairman of the oversight committee led the charge for more centralized delivery, applauded the move. Steve Kearney, the executive director of the Alliance of Nonprofit Mailers, said the change makes the Postal Service a less valuable business enterprise. The USPS inspector general commissioned a survey of 5,000 households in 2015 and found door-delivery customers were less likely to throw away most types of ad mail compared to customers with curb or cluster delivery. For credit card solicitations, for example, 11 percent of respondents who received the offer at their door read and responded to the promotion. For those with cluster box mail, the rate dropped to 3 percent. Sixty-three percent of respondents without cluster-box delivery said they would be displeased if they were shifted to that format, while 17 percent said they would be pleased. The IG hired Michael Bradley, a professor of economics at The George Washington University, to analyze the data and consider other factors that could account for the disparity, but he found no other variables could explain the results. Bradley also analyzed two other surveys, which corroborated the IG’s findings. The National Association of Letter Carriers has historically opposed any transition away from to-the-door delivery. The union said on Friday it was reviewing the changes.